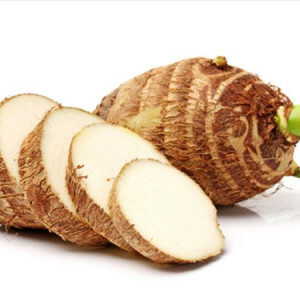 The tasty taro plant refers to several starchy vegetables that are part of the Araceae family. Cultivation of the plant dates back to ancient times. In tropical regions of the world, the plant is a staple food item. In fact, about 1/10th of the world’s population regularly consume taro-like plants. A statistic attributed to the fact that the plant is fairly easy to grow and thrives in the warm, moist environments found in tropical regions. The tuber or underground stems of the taro are brown, round, and similar in form to a potato. In appearance, the leaves are long and floppy, wider at the top and tapering down to a narrow blade. This distinctive feature is often described as being heart shaped or looking like elephant ears. Around the world, the taro goes by many common names including dasheen in the Caribbean, culcas in Egypt, satoimo in Japan, and kalo in Hawaii. Today taro cultivation takes place in dozens of countries. Perhaps the area most important to taro cultivation is Hawaii, where the plant is treated with reverence. It even plays an integral role in the Hawaiian myth of creation. In this mythology, taro acts as an elder brother to humanity, providing nourishment. This love for the plant led to the eventual cultivation of well over 300 different varieties of taro, which grow in various conditions throughout the islands including wet and dry land. Most taro production takes place in fields where a convenient water source is available to provide constant moisture such as with regular rainfall or through irrigation. The plants can also be grown in greenhouses or home gardens. Planting of taro normally occurs in the spring with crops taking 10 months to reach maturity. For those planted in wetlands such as swamps, however, the crops may take longer than a year to reach maturity. Although the taro plant can seed and grow flowers, this seldom occurs. Even when seeds do occur, they are not useable for planting. Instead, the top of the tuber is replanted and then grows new roots. Taro plants are mature when the leaves begin yellowing. Usually the leaves can be harvested at any time during crop growth. In spite of its popularity, all parts of the taro are toxic if consumed raw. This is due to the high levels of calcium oxalate; a crystal like poison that can cause kidney stones and mouth irritation in the form of numbing, burning, or an itching sensation. Proper cooking, however, minimizes the toxins. For instance, the taro can be boiled extensively with the water discarded several times to remove the toxin. The toxins can also be eradicated by seeping the taro in cold water overnight before cooking. The roots also feature a hairy outer coating that can cause irritation from the juices if they touch the skin while attempting to remove this coating. To prevent this issue, those who are cleaning the vegetable can protect their hands by wearing rubber gloves. The taro has a better nutritional profile than other starches such as potatoes and rice and may be used in place of these ingredients. According to the United States Department of Agriculture (USDA), one serving of the root is approximately 104 grams when raw. This serving contains a trace amount of fat and around 120 calories. The root is high in dietary fiber, calcium, potassium, and manganese. Taro leaves are also nutritionally dense and contain high levels of Vitamin A, Vitamin C, riboflavin, and folate. The taro root is said to have a mild flavor that takes on more of a nuttiness once cooked, a characteristic that makes the taro extremely versatile for both sweet and savory dishes. The root can be cooked like a potato and fried, baked, broiled, roasted, or steamed. One main dish idea is to boil and mash the root then mix it with spices, herbs, and other vegetables to form vegan burgers. Cooked taro root also works well in various desserts including cakes, puddings, and pies. In Hawaii, the taro root is most commonly used to make poi, a staple dish made by boiling and mashing the root then adding water to form a liquidly pasty fluid. The poi can be eaten fresh or allowed to ferment for several days then eaten with salted fish. The leaves of a taro are said to have a taste profile that is similar to spinach. Leaves can be cooked like other leafy vegetables such as turnip greens. Alternatively, the leaves can be used to wrap around poultry, beef or some other piece of meat before steaming. Thanks to its popularity, a number of commercial products now feature taro as the key ingredient. For instance, the doughy texture of the starch has led to the development of taro flour. Taro chips, another commercial product, are prepared by thinly slicing the root then frying or coating in a light layer of oil before baking in the oven. Chips are currently available in different flavors such mesquite, spicy, and original varieties which just feature a touch of salt for flavor. Taro Cultivation Practices: This production reviews taro cultivation practices around the world including harvesting, pest problems, and weed control. Taro & Hawaii: Taro origins, its importance to Hawaii, and current taro cultivation practices are discussed in this lesson. Taro Plant Guide: This taro guide covers the uses of the taro plant as well as harvesting, problems with growing, and history of the delectable plant. The Potato Of The Humid Tropics: Learn more about the ancient history of the taro. Vegetables From Underground: The taro and other botanical vegetables are discussed here. Vegetable Of The Month: Tubers: From Fruit & Veggies – More Matters, a Center for Disease Control Partner, this resource explores the nutritional profile of the taro and other root vegetables. What Is Taro? : A look at the Taro plant and its importance and place in Hawaiian culture can be further studied through this resource.